I think I just love the word ‘funfetti’ so much! In case you missed it, I made funfetti french toast for Sunday Supper. The dish was colorful and it brought back to memory all the fun times I had this Summer. And today, I’m sharing another funfetti recipe, in a form of a Raspberry Funfetti Bundt Cake. I rarely go pink and usually only use vanilla or chocolate for my cake. Not sure why, perhaps I’m just playing it safe. But today I’m feeling a bit romantic and decided to add a splash of color to my cake. The idea came to me when I was doing the preparation for this Raspberry Funfetti Bundt Cake. This month is all about sprinkles and as much as I love sprinkles (especially rainbow sprinkles on ice cream), I feel it needs something to complement it. So that’s what I did, adding a touch of pink to my cake. Not bad, eh? And I’m quite happy with the result. This bundt cake totally screams happiness! It does say carnival in every bite. 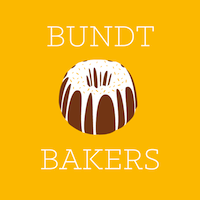 Thanks to Terri of Love & Confections for organizing Bundt Bakers this month because I get to share my happiness with y’all! In a bowl, combine the flour, baking powder, and salt. Set aside. Using a mixer, beat the butter, egg and sugar in medium speed. Add the ricotta cheese and combine. Add vanilla and lemon juice. Mix well. Add the raspberry juice and milk, and mix well. Transfer to a bundt pan and bake for 40-45 minutes. For the glaze: combine all the ingredients. When bundt cake is cool enough, drizzle on top of bundt cake and decorate with sprinkles. I added 2 drops of pink food coloring to this bundt cake. Gorgeous!!!! This cake looks incredible! Love the raspberries and the sprinkles! Gorgeous color in your cake and nice flavor too. Your cake looks velvety, so pretty with the sprinkles you choose too! What an absolutely gorgeous cake! So fun with the pink inside and the sprinkles on top! Thanks, Jocelyn. Hope you get a chance to try this. Oh this cake looks so delicious and FUN too! I love this beautiful color and I can just imagine the wonderful flavor you got from using fresh berries in this cake. This is such a pretty cake, Linda! Love the raspberry glaze and sprinkles! So fun and festive! What an amazing cake recipe! I might need to use this for my daughter’s birthday next month!! Thank you for sharing! This cake looks stunning and so pretty too. I especially love the use of ricotta. A lovely bundt! Great use of raspberry in the cake AND glaze. YUM!!! What a gorgeous cake! I am loving that color! I LOVE raspberry!! I’m also highly intrigued by the use of ricotta. Great recipe. I love the color of this cake, so pretty! And the addition of the ricotta… heaven! Pinkilicious! LOL, great job with this cake! This would be a great one to pull out for Valentine’s Day!